This home page is occasionally and perpetually under construction. I received my Ph. 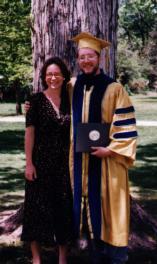 D. in April 1997 from the University of Colorado at Boulder in Electrical Engineering, working in Zoya Popovic's group . I did my undergraduate work at Michigan State University. I have now joined the Radar Systems group at Lincoln Labs. Here are links to my publications and current research, as well as my (old) resume. Also to my photo gallery and my Scouting Resume.